Street photography is a whole different animal. As you can see from the few images I have posted so far portraiture and photographing people is something that I enjoy. Trying get the viewer to have some kind of emotional connection to the image is the goal. But today I want to touch on another aspect of photography and that is…. ‘social photography’ aka ‘street photography’. The classic way is to shoot in black and white which I like because I feel like sometimes colours can distract the viewers attention. Of course all my B&W images are taken in colour and then converted to black and white in post processing. I would like to take this opportunity to also inform you all while this blog is still in it’s early days that I have this philosophy when it comes to capturing images. There are generally two types of photographers, documentarians and pictorialist’s. I work in both of these categories which means that my work flows are very different at times depending on the image I want to capture. And for the record, almost all of my images are post processed using image editing software. Yes, it is easier and less work to get it right using the camera in the first place but more tools are required to finish the art. I believe that cameras, computers, software and all the other types of gear are tools of the trade. They are there to be used whenever and wherever needed to help capture the image. I have digressed away form ‘street shooting’ so let’s return to the subject at hand. Street photographers generally choose the ‘standard’ 50mm lens which gives a wide enough field of view (FOV) that allows them to get close to people in the street but still allows them to capture all the things going on around the subject or subjects. While I like this focal length as well for the job I live in Japan which introduces some additional social factors making it even harder than it normally is to take pictures on the street. I will elaborate on on these factors in a future post. 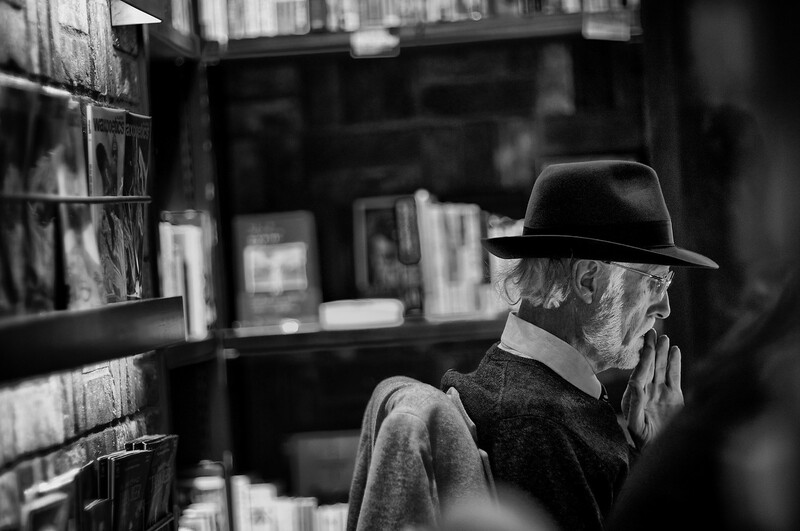 But for now I just want to share an image that I took in a bookstore in the city of Fukuoka. (Click on the image to view larger size) It was taken using a Sony NEX 6 and a old NFD Cannon 85mm f1.2 lens. With just moments to focus and capture the image it was composed to convey the reader sitting in the corner of the bookshop deeply involved with presumably a book and not a computer or a phone:) The difficulty of street shooting with a manual focus lens coupled with being on the streets of Japan keeps these images special in my mind.